Let’s start with the 2015 results for the Hertsmere constituency. Here’s our analysis of the voting two years ago. Four parties stood last time (no Greens) and the Tory share was a substantial 59.3%. According to the excellent Electoral Calculus, Hertsmere is the Conservatives’ 103rd safest seat and Oliver Dowden has a 97% chance of retaining the seat so all the action this year will be at the margins. Will the Liberals lose share, as some predict? Will Labour do better than expected? Here’s what we know about them so far. And what about that other big vote?. Our polling district voted Leave by a margin of 1.6% (50.8 – 49.2%), putting the district 262nd of the 382 UK polling districts – meaning that 261 districts, or 68% of the total, had larger majorities for Leave. We put together a quite detailed analysis of the Brexit vote in Hertsmere – putting the local vote in the regional and national context. Referendum vote counting was done differently from election counting, so we don’t have ward-by-ward voting data, except for neighbouring Shenley, which, thanks the BBC’s Martin Rosenbaum, we know voted Remain. Before the 2015 election we ran a survey. We wanted to know what were the Radlett issues that got you all voting. The big issue last time around was the railfreight terminal- a story that has moved on since then but is still not in any way resolved. Do please take two minutes to fill in this year’s survey! It’ll take two minutes and we’ll share the results here and on Facebook and Twitter. What to do on the big day. There are usually four polling stations in Radlett – the United Synagogue and the Radlett Centre, Newberries Primary School and the Phillimore Community Centre, and if you don’t know which one is yours, there’s a handy web site where you can find out. It was, let’s face it, a surprise. As late as the close of polling on Thursday bookmakers were still offering 7/1 on Brexit (that’s a 12.5% probability). The opinion polls weren’t too far off for this vote but still gave Remain a small lead. 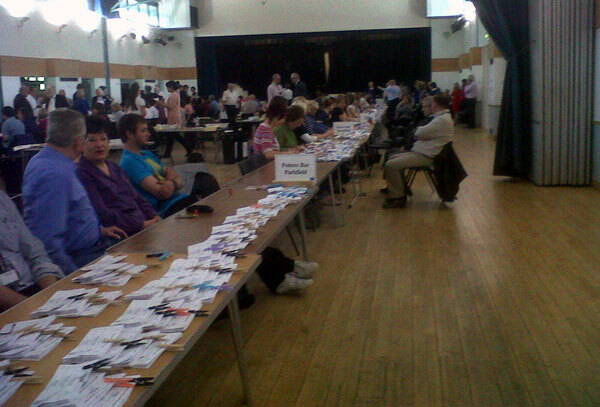 Our polling district, Hertsmere, voted Leave by a margin of 1.6% (50.8 – 49.2%), putting the district 262nd of the 382 polling districts – meaning that 261 districts, or 68% of the total, had larger majorities for Leave. The table, which uses data from the BBC web site, puts Hertsmere in the context of its immediate neighbours and confirms what we essentially already know about the vote in England. London, and a handful of other urban districts, voted Remain, while prosperous suburbs, rural areas and struggling towns voted Leave. The three London boroughs to Radlett’s South voted Remain and all of our other neighbours outside London (except St Albans) voted Leave. For comparison, I’ve included London itself and the constituency with the largest Leave vote – Boston in Lincolnshire – and the one with the largest Remain vote – Lambeth (I’ve excluded the obvious outlier, Gibraltar, where all but 823 people voted to remain). It’s difficult to know how Radlett itself voted. The referendum poll – unlike general elections – is not broken down by ward and, of course, there’s no such thing as a ‘safe seat’ in a referendum. Every vote counts. Thanks to Martin Rosenbaum at the BBC, though, we do know how the good people of Shenley voted. He used FOI requests to get referendum voting data at the ward level from all the UK local authorities that collected it. So, although it’s not clear why Hertsmere reported voting for Shenley and not the other wards, we are fairly sure that Shenley voted Remain. Our own opinion poll of local voters gave a small win to Remain. And incidentally, the Radlett margin predicted by our poll (which closed on the morning of the referendum) was exactly the same as the actual margin achieved by Remain in critical North East district Newcastle upon Tyne – the first mainland seat declared and the one that got Remainers sweating because it came in below the number suggested by the BBC model. Some local people are clearly in shock – especially those whose jobs depend on the financial sector. Others are celebrating. Were you surprised by the result? Do you think we’ve made a terrible mistake? Or is this, as Nigel Farage puts it, a ‘new dawn’ for Britain? Leave a comment below (anonymously if you like) and we’ll share your reactions here, on Facebook and on Twitter. The Guardian and the BBC both have excellent detailed analysis of the national results. Lord Ashcroft’s detailed polling, published the day after the referendum, is essential reading. How will Radlett vote in the EU referendum? UPDATE: we closed the poll early this morning, before voting in the referendum began. A total of 361 votes were received. The final results are in the poll box below. It doesn’t matter where you stand on EU membership – everyone is agreed that this may well be the most important vote that any of us make in our lifetimes. And the drama, the acrimony, the unexpected twists and turns have made the campaign so far the most gripping/energising/infuriating (take your pick) in recent electoral history. So wouldn’t it be interesting to know how Radlett is going to vote in the referendum? In general and local elections, Radlett votes Conservative. And Conservatives, if the polls are to be believed, will vote leave, by a substantial majority. So will Radlett vote leave? Or will a commuter town with a big dependence on the City and on the financial sector buck the trend and vote to remain? With ten days to go before the real vote, let’s find out. Vote below to tell us how you’re planning to vote (anonymously, of course) and we’ll share the results here and on our social media accounts. In the poll below, we’ve used exactly the language that you’ll see on the referendum polling form and we’ve added a third question for don’t-knows and people who haven’t made their minds up yet. You can only vote once and you can see the results so far once you’ve voted.